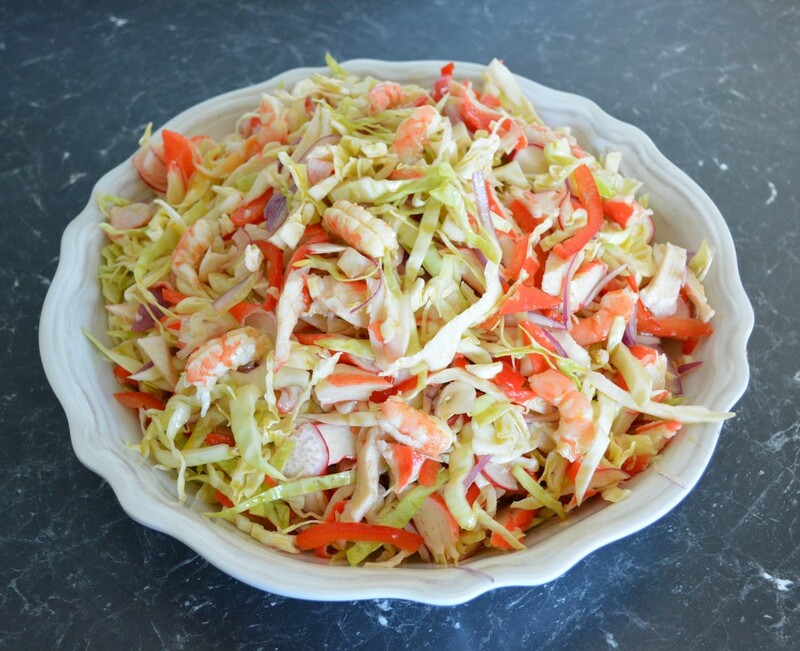 Growing up this was known as crab salad in our house, my mum made this all the time. The seafood extender was the crab element. This is a lovely salad. I like it for lunch or as a light dinner. I also like it on mountain bread as a wrap, it is great. The dressing amounts are a guide, you can add less or more oil and less or more vinegar, it is up to you. I taste it as I go and keep adding until I have the flavour I like. You can use different vinegars also, white or red wine vinegar works nicely to. You can also use mayonnaise instead, like in coleslaw, I just prefer the lightness of a vinaegrette dressing. If you don't want to buy prawns, they can be expensive, you can leave them out, there is enough seafood extender that they won't be missed. I just love them, so I add them. This is a great salad to take to a Christmas lunch, it looks festive and tastes great with very little effort. 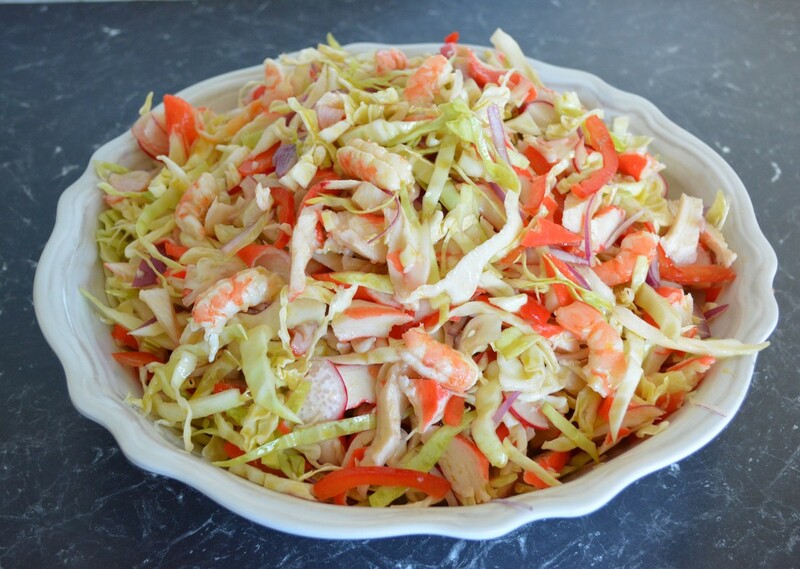 In a large bowl add prawns, seafood extender, capsicum, radishes, onion and cabbage. Toss to mix well. Add 3/4 cup of the oil, 1/4 cup of the vinegar, salt and pepper, mix well to combine. Add the remainder of the oil and vinegar if you think the salad needs it. This salad needs a lot of dressing or it will be bland and dry. Keep adding more dressing until you love it when you taste it. Refrigerate for 2 hours. After the 2 hours if the cabbage has released a lot of water, pour it out, you don't need it. Taste, add more dressing if needed. Cover, refrigerate until needed.